The Fort Washington Food Pantry is located in the second floor of the educational building of St John's Church - Broad Creek. For the last 30 years it has been open each Saturday morning to offer much needed groceries to local families in need. 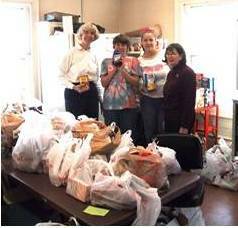 The Food Pantry is sponsored jointly by St. John's Episcopal Church, and Grace Lutheran Church, which are located in Fort Washington, Maryland. We are a 501(c) (3) in the name of St. John's Church - Broad Creek. Our sponsors furnish most of the volunteers who manage and operate the food pantry. They raise money and they locate and transport huge quantities of needed food. We are also grateful to a number of generous corporations, non-profit groups, and farmers, who share with us their surplus food. Many individuals and organizations offer cash donations which allow us to round out our food supplies to make a balanced menu. The Mid-Atlantic Gleaning Network's mission is to fight hunger by harvesting fresh fruits and vegetables from farms and orchards through a parthership of farms, donors, volunteers, and food providers. We are grateful recipients of this work. The Gleaners need volunteer assistance and will share produce with those volunteers. Call 703-370-0155 for their schedule. The Gleaners maintain a wharehouse in Cheltenham, Maryland on Highway 301. For more information visit their web site at: www.MidAtlanticGleaningNetwork.org. Panera Bread Cafe of Waldorf bakes and sells artisan bread. The Food Pantry thanks Panera for their "Breadonation" each Friday morning. High quality Panera bread is a real treat for our client families. 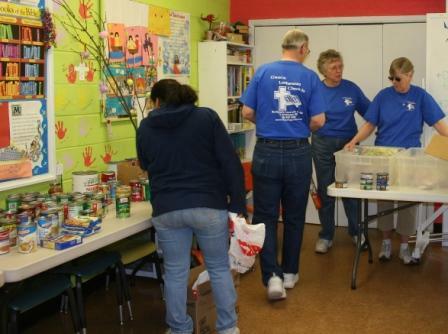 To date, the Food Pantry gave food to more than 650 families. It takes a lot of cans and boxes to feed that many people. We are very lucky to be beneficiaries of Scouting for Food. Each November area Boy Scouts and Cub Scouts bring us much needed food supplies. Scout Troop 1572 of St. Mary's Catholic Church, Piscataway and Cub Scout Pack 1661 and Boy Scout Troop 1551 both of Fort Washington Baptist Church bring us so much food! Bags of food are everywhere, even down the hall. In no time, the shelves will be filled to overflowing. Jesus said, "I was hungry and you gave me something to eat, I was thirsty and you gave me something to drink, I was a stranger and you invited me in."